We are neck deep writing the 2014 edition of our BDR / SDR metrics and compensation report. This year we had 200+ valid responses and roughly 160 of those shared compensation data. A huge thank you to all who participated! Since 2007, we've reported SDR compensation as a national average. Every year, you've asked for more specifics (how about our region, our price point, our hiring profile, etc.). Well, I finally have something to share. This year, we isolated 6 variables that impact compensation. 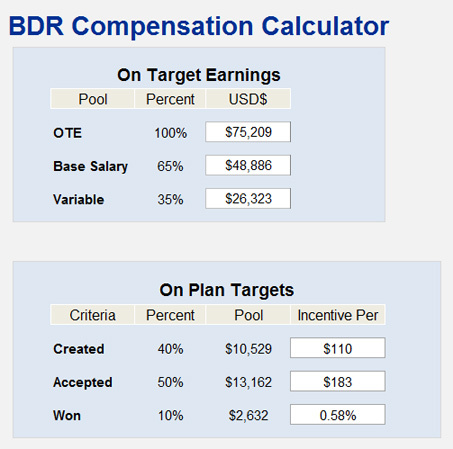 The result is our new BDR Compensation Calculator. See a sample 'output' below. I've included help text within the tool. I also shot a quick video walkthrough. I hope you find it useful.